Lake Augusta has been an underrated fishery. 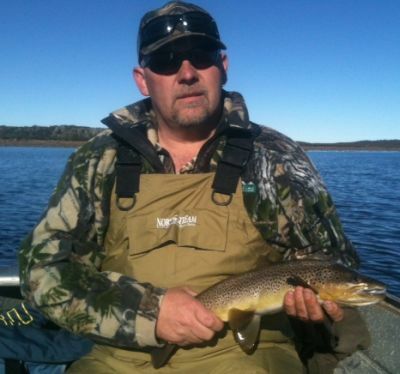 It has as much to offer as any other water in the Western Lakes region and as Todd Lambert found out recently, given the right conditions, your bag limit can be caught in a matter of minutes should everything fall into place. We fished Lake Augusta alongside Mark Tapsell today. We finished with four well conditioned browns and missed numerous others, probably each of us should have caught our bag if luck had gone our way. 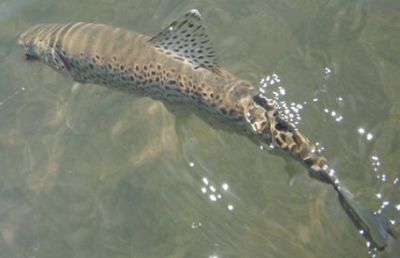 All fish were taken on dun patterns although the real deal was hard to find on the water. We were both pleasantly surprised at the condition and strength of these fish. There is plenty of water in Augusta at the moment. The IFS guys were out and about conducting licence checks and said they had been issuing a lot of infringement notices to unlicensed anglers. 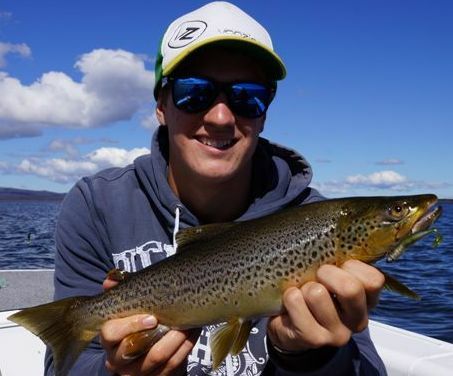 Had a trip to Lake Augusta today with mad George Papp,arrived at 11am and finished fishing around 4pm. It was bright and sunny conditions with light n.nw breeze. We had a lot of fish feeding on top early on to gummies, but going quiet later on when breeze picked up a bit, we managed 16 browns and 1 rainbow We only keeping our limit of five each of course with the rest released to fight another day. Had a trip up to Lake Augusta today with my brother Paul and his son Nathan. We arrived around 11am and finished around 7pm. It was mostly sunny and a light southerly breeze. We managed to catch 13 trout, one being a rainbow. It was Nathans first time here and one day he wont forget as he bagged out. 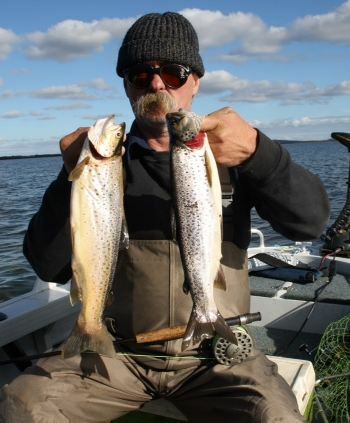 The fish were caught on yep red nut, berkley black & gold t.tails and olive pearl t.tails. The size of fish was around 1lb up to 3lb.most in good nick,a couple were average. The fish had been feeding on scud and gum beetles. I had grand plans to get up at 4am this morning and fish the wind lanes at Lake Leake. I must be getting soft,... as I chose "'Plan B.'" Plan B” was to sleep in and head to Lake Augusta at around 9am...a much more civilized option. As I was heading up, I passed Johnny Dekkers coming down the hill; he was on his way home from Penstock where he managed a couple of quality fish. Given today’s the fantastic weather forecast, Mark Tapsell and I decided to head up to Lake Augusta for a couple of hours. Leaving home at 5.30am, we arrived to blue skies and a mirror- like water. We proceeded to cook up a quick egg n bacon roll and brewed a coffee before heading out. Once on the water, we weren’t there long and we had a couple of nice trout in the boat, both caught on orange bead head nymphs hung 2 feet under a dry. Hi all, we fished Lake Augusta West today with Bailey and Jack Shennan, on our way home from Lake King William. There was a S.W wind blowing about 15 to 20 knots with sunny periods. 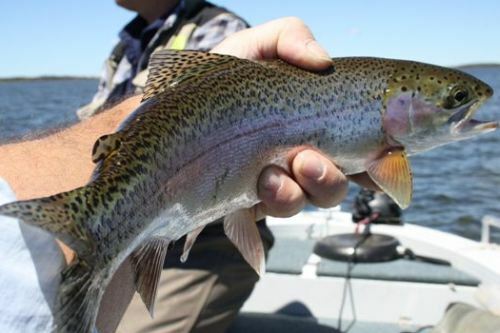 We caught 13 fat trout, one being a rainbow which Jack landed. Oh what a day! Arrived at Lake Augusta at 8 am this morning to find the most perfect conditions a bloke could ask for on his Christmas “wind down”. Over the space of the morning I managed to net 19 fish wading the shore, all in lovely condition. All were browns, not a rainbow to be seen. Lake Augusta is part of the Nineteen Lagoons area in the Western Lakes. Access to these lakes is via the Liawenee Canal road on the western shore of Great Lake. Lake Augusta is used by the hydro to catch and redirect the water draining from the Western Lakes down the Liawenee Canal to fill the Great Lake.